I don't pay attention to polls, especially this early in an election season. They are wildly inaccurate even in the best of times, let alone now when the various parties are only just starting to campaign. Despite that, every now and then some interesting point shows up in the information. Someone floated a suggestion that Moshe Kachlon should open his own political party focusing on social issues and run in the upcoming elections. Immediately the pollsters went out to see how much strength such a party would garner. Now, I heard Moshe Kachlon on the radio saying he has no idea where that idea came from, he is not involved in it, he has committed to supporting the Likud, just a few days ago he directed the Likud convention to discuss and decide on the unified list with Yisrael Beiteinu, and that he is not opening a new party. Despite his denial, rumors persist and the polls are the polls. It turns out that at this point, the polls predict that if Kachlon would open a party and run, he would win 20 mandates. Very nice. The interesting thing is what I heard on the radio this morning. The pollsters have taken it further and have new information for us. If Kachlon would open this party, it would get 20 mandates. if he would add Tzippi Livni to his list, they would get 26 mandates! Tzippi Livni is like the Lebron James of Israeli politics. She is [considered] a superstar with no home. the pollsters have placed her with the Labor party, with Ehud Olmert in a new party, with Yair Lapid, with Ehud Olmert in Kadima, a new centrist party of her own, and now with Moshe Kachlon's potential party. The only arty I havent seen her associated with [yet] is Likud Beiteinu. I'd like to see polls showing what would happen if she went back that way. 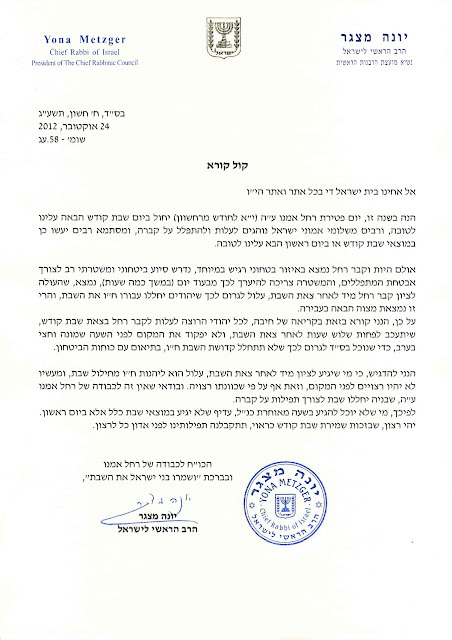 After Modiin Ilit announced the development of a new archaeological park that would only be open to haredim, Modiin decided they would do whatever possible to lock out haredim from enjoying the popular Park Anabe in Modiin. The problem is that limiting entry to a public park is illegal, so they had to find a solution to figure out how they could block visitors from Modiin Ilit. Legal Counsel for the city of Modiin solved the problem writing an opinion that based on the law, Modiin cannot discriminate and prevent entry to visitors from anywhere else, or certain types of visitors, but they could do so on a temporary basis, such as for the duration of a holiday. If I understand it correctly, because it is a holiday they could limit entry to only locals, residents of Modiin - and prevent entry to others so as to allow the local residents to enjoy a city park. But only on a temporary basis. A human rights organization is now suing Modiin for discrimination. Their lawyer has sent a letter saying that preventing entry to non-residents is illegal and is discriminatory against a religious group. So, there is a machloket between lawyers whether such a policy is legal or not even on a temporary basis. I figure they will have to prove that the policy was discriminatory against a "religious group" (i.e. haredim). Even though it might have been well-known that that was the purpose, they blocked everyone from outside of Modiin, and they didn't discriminate between haredim and non-haredim in implementation of this policy. All non-Modiin people were turned away. On the other hand, Modiin probably can't use the argument of Modiin Ilit's archaeological park to its defense, or maybe as a threat of counter-suit, because that park is not yet open and no discriminatory policy has [yet] been put in place, despite talk of future plans to do so. b'kitzur, Modiin should not have acted like a bunch of kindergarten kids with this behavior. Good news for the residents and visitors of Bet Shemesh..
First of all, we have confirmation from the Minister of Transportation Yisrael Katz himself that Highway 38 is one of the roads that have been specially approved for upgrade, despite the general freeze on new tenders. 8 roads have been approved for upgrade, despite the freeze, due to how dangerous they are. All 8 roads are 1 lane in each direction and will be upgraded to two lanes each way. The upgrades to these roads will be concluded by 2016. Second of all, the work on Road 10 is being completed. As you can see if you drive to or from Bet Shemesh, the new intersection with a traffic light on Highway 38 is nearly complete. In the press release announcing the progress of the road works, it adds that the traffic light will be synchronized with the traffic light next to the train tracks (which will eventually be an overpass), and also will be configured to take into account the traffic patterns, giving priority to those leaving Bet Shemesh in the morning hours, and priority to those coming to Bet Shemesh in the evening hours. In order to complete the work, Road 10 will be shut down from Thursday night at 8 PM until Friday morning at 6 AM when it will [hopefully] reopen. Highway 38 will be sporadically blocked as well, in order to complete the intersection, starting from 9:30 PM on Thursday night. The new intersection is expected to be opened on Friday morning. Hopefully this will ease some of the traffic problems on Highway 38, as it is meant to. Kol HaKavod to the mayor, Moshe Abutbol, who has pushed this project through after years of stagnation. It's Official... Olmert Decided To Run! with 20,000 other people, that is... in the Tel Aviv Nike 10km race last night! 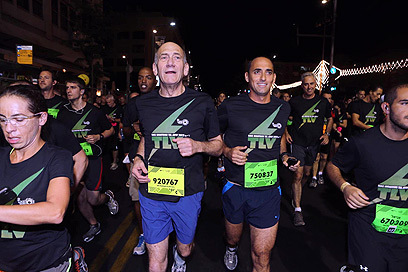 Ehud Olmert ran the 10km... will he also run the longer race to PM? I am impressed with his time of 55 minutes.. That is about my speed for 10km, give or take a few minutes and depending on the course and the elements..
A newly immigrated Ethiopian Jewish boy attends a welcoming ceremony at Ben Gurion Airport, Israel, Monday, Oct. 29, 2012. Some 240 Ethiopian Jews arrived Monday, as part of Operation “Dove’s Wings” to bring to Israel the remainder of the Falash Mura, a group of Ethiopians whose Jewish ancestors were forcefully converted into Christianity. This song, Mashal, is from Karduner's new album..
9. Daddy, this one's for you..
Two different articles, on two different news media websites, making a very similar point, offer something very interesting to consider. Basically, two journalists, Tali Farkash of Ynet and David Newman of the JPost, have both pointed to the recent yahrtzeits of Rachel Imeinu and PM Yitzchak Rabin and have commented on how the two are so close together, and share a yahrtzeit, yet are worlds apart from the perspective of who paid visits to those graves. Do the visitors of one, care at all about the other, or about the visitors to the other? Is it symbolic of our seeming inability to live side by side with some sense of a live and let live philosophy? mutual respect despite our differences? It is an interesting observation to consider..
Basically, a couple honeymooning in Israel gave a ride to a couple of hitchhiking soldiers. They were very impressed with one of them, a soldier by the name of Lior, that they decided to name their son after him. They knew nothing else about him, and when little Lior got a school project to find out the origins of his name, he wanted to find out more about his namesake. 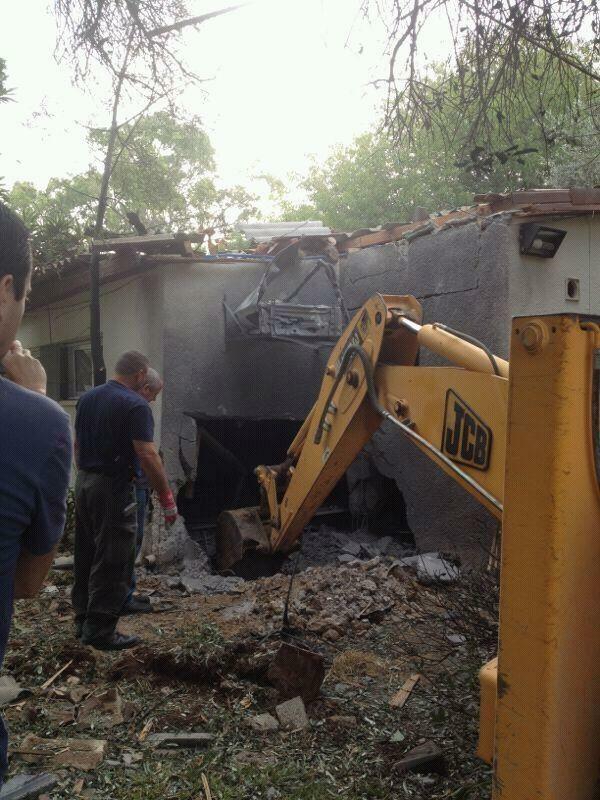 They are now on a search for Lior, who was "at the Mahanayim Junction. One of the soldiers was Lior, who was a sergeant in Military Intelligence serving at Har Bental. He was dark skinned, the couple is not sure if he is of Ethiopian or Yemenite descent. They say he had good English and was very handsome, and that they fell in love with him"..
"Sometimes you wanna go, where everybody knows your name...."
What was an amicable divorce has turned ugly, and keeps going back to beis din (in Tel Aviv). The couple shared a happily married life with a strict haredi lifestyle. The husband went through a process, over time, in which he changed his lifestyle and left the haredi community. He stayed religious, but that change along with some others caused a fallout in his relationship with his wife. Eventually it even led to a divorce. The divorce, as mentioned, was amicable. The division of assets was done in a friendly and good-natured manner, with the husband agreeing to pay for their 3 children's education, and the two agreeing on raising their children with a stress on showing respect for both of their parents. They even agreed to allow the kids to see the father whenever they would want to, in addition to the twice weekly and every other weekend they would be with their father. Shortly after the agreement was signed and then approved by the beis din, the ex-wife reneged on everything she had agreed to. She didn't let him see the kids at all, and he found himself powerless to do anything about it. Eventually he filed suit in beis din, demanding they fine her tens of thousands of shekels for breaking the visitation agreement. Her response? Why won't she let him see the kids? Because she is concerned that his non-haredi beliefs will affect their lifestyle, and they will be distanced from their own haredi community because of it. According to the report on Srugim, the beis din is trying to come to a decision as to how to deal with the case, whether to fine her or not, and how to work it out so that the kids will be able to visit their father in a reasonable way. Wild. Whatever level of religion he decided to keep or not keep, she should have no right to make such a decision to prevent them from seeing each other. Especially doing so in such a devious way, where she cooperated fully to get him to pay for everything, while promising him fair visitation and then not keeping her side of the agreement. he is their father as much as she is their mother, and he should be allowed to see them and have a relationship as well. -- PM Benjamin Netanyahu, at the Likud Central Committee meeting ratify the unity deal with Yisrael Beiteinu.. I know there are no rules about these things, but I was surprised to read that aJachnun restaurant has opened on Shabbos in Jerusalem near the Mahane Yehuda shuk, to serve the youth of Nachlaot. Jachnun, being a traditional Yementie dish, is not the type of restaurant I'd expect to open on Shabbos. Yemenite Jews are usually very traditional, if not religious. I guess in the melting pot of Israel, Jachnun is no longer just a Yemenite dish, it seems, but has become an Israeli dish. 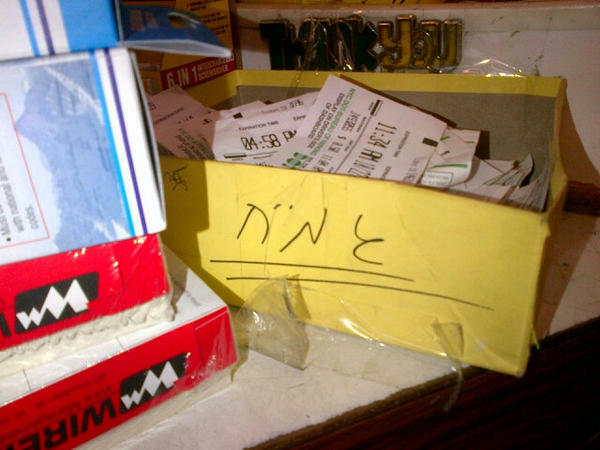 According to Mynet, two young fellows in the Baka neighborhood decided that with all the restaurants closing on Shabbos, they would make their Jachnun and sell it. They did well enough that they decided to go bigger. They opened a shabbos "restaurant" at the edge of the Mahane Yehuda shuk in order to get the young Nahlaot crowd as customers. They say they arent even profiting from a business perspective, based on the investment of expenses and the time they put into it. But they wanted to do it after they noticed that this area had turned into a "desert" in relation to places open to eat. A secular activist group is pushing them along and helping to promote it to make it a success. 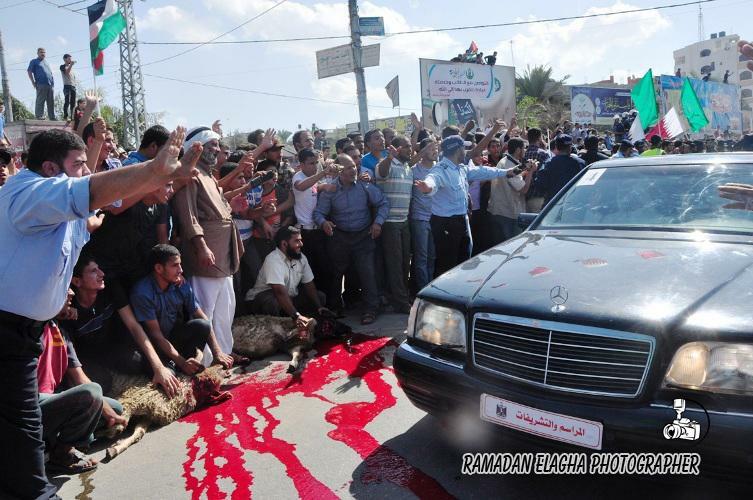 The local UTJ branch of Jerusalem has declared this as a breach of the status quo and say they will fight this. What's the red string about? Why do people wear red string around their wrists? Why do they sell this red string at various holy places, such as near the Kotel, by Kever Rachel, and by many of the other grave sites of tzaddikim? I always thought the string supposedly originated from someone who would take these balls of yarn, or bundles, and walk around kever Rachel 7 times chanting certain prayers, and the red string was supposedly expected to ward off ayin ha'ra, the evil eye. Whether somebody actually took the balls of red yarn and walked around the kever and actually imbued it with whatever powers it supposedly has, is obviously a different story. But that is what I thought it was supposed to be. The association between the red string and kever Rachel is, for some reason unknown to me, very strong and behind the entire mystic belief in the red string's powers. Due to the yahrtzeit of Rachel Imeinu the other day, someone asked Rav Shmuel Eliyahu about the segulah of the red string. In my opinion, if anyone would know what the red string is all about, it would be Rav Shmuel Eliyahu. Rav Shmuel Eliyahu's father was Rav Mordechai Eliyahu zt"l, considered one of the greatest kabbalists of recent times. I am sure there are plenty of other people who also know, but I am confident that if anyone knows, Rav Eliyahu knows. Rav Shmuel Eliyahu's response was, according to the article on Bechadrei (quoting from the Yeshiva website, though I couldn't find it there), was that people should be careful not to be too drawn to the strings. The original purpose, he said, was to give the person the feeling of a connection to the tzaddik, to the place. The red string is kind of like tying a string around your finger to remind you of something, or wearing your watch on the "other" wrist for that purpose. The string, Rav Eliyahu said, would be taken and tied to his wrist so as to remind him of the tzaddik, but there is nothing mystical or magical about it. And that is the purpose of the red string. If you are scratching your head wondering what the picture is of, it was posted on Twitter as being a new "parking meter g'mach" for a certain street in Boro Park. The way it works is, if you should get a parking ticket on that street, you can contact the g'mach and look for a parking receipt (from someone else who donated it), with which you can "prove" that you had paid for parking and thereby challenge the ticket in court. I should note that civilly this is illegal, and is outright thievery, and halachically as well, as much as I can figure out. 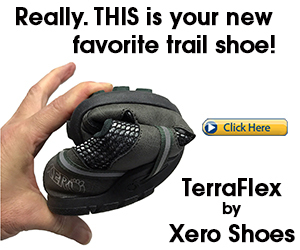 I have not yet been able to think of a reason it should be allowed to do this. 6. The Rabbi's Elephant - while everything he says is true, I disagree with the premise. I have not or come across plenty of "Rabbi's sons" who also "went off"..
"Kosher without a hechsher" is a new phenomenon spreading in Jerusalem where vendors have decided that they will no longer play along with the Rabbanut. While they are under the threat of fine for using the word "kosher", as only the Rabbanut has the legal right to use that word in authorization of food as kosher, the restaurant owners don't seem to care, and are increasingly rebelling against the Rabbanut in this. The restaurant owners are upset with the increasingly strict demands, and are fed up with the conduct of the mashgichim, according to the Haaretz article. A group, in the meantime, has asked the anti-trust authorities to look into the way the Rabbanut tells vendors that they can only order from certain suppliers. With this growing phenomenon, the Rabbanut is looking at what could be a major problem. Can a person eat in such a restaurant, where the owner says it is kosher but without a teudah? Technically, if the vendor is religious and/or trustworthy, the rule all kashrus is based on is eid echad ne'eman b'issurin - one witness is believed in these matters - and therefore a trustworthy vendor should technically be believed. On the other hand, we know how complicated kashrut has gotten over the years, and not everybody is an expert in the details. He might be trustworthy, but does he know the rules he is supposed to be adhering to? The teudah of kashrut in a restaurant guarantees a certain level of reliability. Whichever organization is providing the certification, they are declaring what the level is, though most people don't really know what level each organization uses and only trust them based on reputation alone. Without that, the potential customer really has no idea what the owner is deeming to be kosher. I wouldn't eat in such a restaurant, but it seems there are enough people who will. According to the article, additional restaurants are joining the movement...I dont know what the mashgichim are doing to drive restaurants away from the Rabbanut like this with their conduct, but they should perhaps undergo some sort of retraining before this gets out of hand. The picture above is of the memorial service for PM Yitzchak Rabin. You can see his grave, and the grave of his wife Leah Rabin, just in front of the cluster of Israeli flags and microphones. In the foreground of the picture is the fairly fresh grave of PM Yitzchak Shamir, beside his wife, Shulamit. As you can see, Rabin has been so canonized that the soldiers in the ceremony seem to think nothing of sitting on the edge of the grave of a different prime minister - nobody else besides for Rabin seems to matter. In an interesting piece of local news, Rabbi Spektor, Rav of the Givat Sharret neighborhood of Bet Shemesh, is trying to do something about tzedaka that has become fairly common in the United States. In many cities in the United States with a significant Orthodox Jewish community, the local organizations, often under Agudath Israel of America, set up a clearing house of sorts for dealing with collectors from out of town. They set up this body that receives applications from potential collectors who wish to come to town and collect tzedaka. they investigate the applicant, and, if he passes the investigation, receives a letter of certification from the office. He can then take that around town and use it for collecting - it shows the locals, who usually have no way to verify the integrity of any given collector on their own, that this collector has been verified as collecting for a legitimate purpose. For this to function successfully, the local community must participate and only give to collectors bearing the certificate - if the community isn't strict about this, collectors won't bother to get verified. Back to Bet Shemesh now... An article in Tmura, one of the local weekend newspapers, mentioned that Rav Spektor has decided to establish such a body in Bet Shemesh, under his auspices in conjunction with a number of other community rabbis from that neighborhood, who were listed. The moked set up will receive applications from potential collectors looking to collect in the Givat Sharret neighborhood, and will check them out - they will hold an interview, they will investigate the applicants lifestyle, they will look over the applicants expenses, and other means. Assuming the applicant passes muster, he will be given a certificate with which he can collect in the area. This will filter out the "legitimate" collectors and make it easier for the donors to happily donate without questioning anybody's legitimacy or integrity. The success of this endeavor is dependent upon the residents cooperating and donating only to collectors with the authorization of this moked, and also to direct collectors, who might not be aware of the new arrangement, to the moked for certification. This arrangement is good for both sides of the tzedaka. The collector will be seen by all, or at least by those who accept the word of the moked, to be legitimate and will donate to such collectors, perhaps even more than they used to. The donor will know that the person at the door with the certificate form the moked is legitimate and will be happy giving his tzedaka to someone who really needs it, and will be relieved that he does not need to do any checking on his own. The moked is starting to operate in and for the Givat Sharret neighborhood, but the goal is to expand to the entire Bet Shemesh (including RBS). Being a new arrangement, kinks need to be worked out, and the public has to cooperate and send collectors to the moked, and not donate to those who have not been authorized. One major difference between the way this moked will run and the way they work in the US is that in the US the authorizing body usually either charges a fee to the applicant, or the donors are meant to write checks out using the name of the office. Before the collector leaves town he goes to the office and clears all his checks, minus a percentage taken by the office. It is a win-win situation, and the office thusly has its expenses covered by the fee collected. This new moked in Bet Shemesh will not be charging a fee and will not be taking a percentage, but, I am told, will be run on a volunteer basis. Donors will give their money and write their checks directly to the collector. I guess office expenses will be covered by sponsors and other donations. The moked will operate in the miklat of the Ohel Yona Menachem shul in the Sheinfeld neighborhood on Sundays, Tuesdays and Wednesdays between the hours of 20:15-21:00 (8:15 PM until 9 PM), and can be reached by phone at 074-701-3056. I wish the moked much success, and remind you that for it to succeed, it requires all of our cooperation. In honor of the yahstzeit of Rachel Imeinu, masses of people have been goin to pray at kever Rachel since Thursday night, to the point that Egged was not able to deal with the crowds and people gave up on the bus system and marched from Tzomet Gilo to Kever Rachel. 4. Rav Aviner deserves to be put in cherem - a bit harsh, just because he doesnt like a certain psak... This latest psak shouldnt surprise anyone, as Rav Aviner has always been considered fairly extreme (in the DL community) on the issues of women in the public eye, and men and women mixing at events. Besides, Tzippi Hotovely announced that she has a letter from Rav Aviner allowing her to run for Knesset and that his opinion is just on a theoretical basis, that it is preferred they dont run, but in practice he actually [usually?] allows it..
David Landau has written a piece in Haaretz that I largely agree with, but one point in it was new to me. The article is about the Women of the Wall fight about davening at the Kotel, Anat Hoffman being arrested. The article surprised me, especially considering it appears in Haaretz. In it Landau posits that Hoffman and the other Women of the Wall are being provocative. Landau compares her, and their, antics, to imagining a Protestant Christian cleric leading a group in Catholic Rome. They wouldn't be tolerated, but would be removed. A protestant cleric in a Catholic church in America would also not be tolerated. The Satmar rebbe going into a Reform temple and leading a group according to the customs of Satmar would also not be tolerated. Landau's position and argument is based on his statement that Israel's state religion is Orthodox Judaism. Considering that point, his argument makes sense, though it seems more like Landau is being cynical in order to get to his main point, the conclusion. A very important point he makes in conclusion is that the only way to change that is by more non-Orthodox moving and living in Israel. Only in that way will they be able to have more influence, and change things like this. Israel's state religion is not officially Orthodox Judaism, but it seems to be so by default. As many have said, for many of the secular, the shul they don't go to is an Orthodox shul. Funding and governmental support is directed unequally in favor of Orthodox institutions to the detriment of the Reform and Conservative organizations that are really very small. The only way to change that is not to provoke the system but to get more numbers on the ground. If they bring more Jews associated with the Reform and Conservative movements to live in Israel, they will bring more equality to the distribution to those groups, and they will obtain more influence on society. And, yes, I think more Jews should come to Israel regardless of their affiliation. To start off with, this headline, written as it is, made me laugh. I think it needs to be rewritten, as it seems to indicate that it is immoral to donate sperm to a single woman, but it is moral to donate sperm to multiple women.. but somehow I don't think that was the intention. Besides for that, the issue is one that requires great sensitivity. The decision quoted leaves a point unanswered, I think. I get that in his opinion it is immoral to the child to raise him or her with just a single parent. One can agree or disagree, but I can understand the opinion. "There is an insolvable problem: It's immoral toward the child," Aviner stresses. "A child needs a father and a mother. That's how God Almighty created his world. "We know that there are widows and there is also divorce – but that is a real tragedy. One must not organize such a situation in advance. There are also single mothers who had a child out of wedlock, but that is a given situation as well. But a child needs a loving father and mother." And what about the single woman's distress? "We understand that the girl wants to get married and can't wait to give love to a cute little creature – but why create a single-parent family in advance? The child will be miserable. It seems a point was missing. According to the answer, it seems as if Rav Aviner was under the impression that such arrangements are being made as a preferred method for these single women. As if they choose to be single and have children as single mothers. That is not how it seems to me. It seems to me that the situation is just about similar to the other examples listed, of widows or widowers and divorcees who have to unfortunately raise a child or children by themselves. The single woman getting older wants to get married and has spent many years looking to get married. She wants to raise her children in a traditional family unit. She has not, unfortunately, been successful, and has come to the point where she is concerned about her future, to the point that it has become now or never, and has decided it is time to move on regardless of the marriage situation. I am not arguing with the psak. I don't know if the above reality makes it more moral or not, but at least it should be considered properly. This Shabbos, the 11th of Cheshvan, is known to be the yahrtzeit of Rachel Imeinu. That means, people will be flocking, by the thousands, over the next few days, to pay respects and offer prayers at Rachel's burial spot, kever Rachel. Especially busy will be Motzei Shabbat, this Saturday night. Chief Rabbi Yona Metzger issued a warning, and a call of concern. The expected masses on Motzei Shabbat will require the security services, both the army and the police, to go into high gear to prepare the security arrangements. The police will surely begin their preparations during the day of Shabbos itself. Rav Metzger calls upon the people going to visit and daven by Kever Rachel to be careful to not be the cause chillul shabbos, and therefore to only begin going to the kever at least 3 hours after Shabbos is over, not to go before 8:30 PM, and even, if possible, to not go until Sunday. And, Rav Metzger concludes with a prayer, the care for Shabbos should ensure the acceptance of our prayers.. The following video offers a fascinating look at the relationship between three Dati Leumi rabbonim and their relationships with their daughters who have gone "off the derech". I am not familiar with two out of three of the rabbonim profiled, but the one I am familiar with is Rav Shlomo Aviner, who is definitely a major force in the rabbinic world of the Dati Leumi community, even perhaps one of the gedolim. The video shows them from a very human perspective. The Rabbi's Daughter from בית ספר מעלה on Vimeo. By the very nature of their agreeing to be a part of this video project they have shown themselves to be, at least somewhat, accepting of their daughters as they are, without bitterness towards the decision to follow a different path. I am sure they all went through difficult periods, as does every parent whose child chooses a different path from what the parent had hoped and expected of them, but the acceptance and the beauty of the continued relationship, to the point of being so open about it on camera, struck me in particular. There were some moments in the video that stood out to me. The main one being where the daughter spoke about how maybe by being respectful and accomodating they are sending mixed messages to their parents, giving them "hope" for the future that they might "return", and perhaps that is the wrong way for them to behave and maybe they shouldn't be so respectful. My wife noticed that the daughters profiled were all artistic, and perhaps their artistic nature had something to do with them being the exceptions in the family, willing to be different. It is a fascinating look at a relationship that too many people suffer through, and at times you see a glimmer that they are still struggling, from both sides, with what is happening and the decisions being made. 6. Who is responsible for children's behavior? I am sometimes amazed, while being shocked, at things I see and in comparison to how I thought these things work. I always thought that hassidim were much more obedient to their leaders, their hassidic rebbes, than us non-hassidic (Litvishe, yekkishe, whatever other ashkenazi non-hassidic groups there might be). The hassidim (the ones I know, at least) ask their rebbes everything about their lives, in a way that others dont. They dont move without asking the rebbe. According to Kikar, the kids of the Seret Vishnitzer Rebbe are fighting over who will take over (eventually, until 120), and in the process they and their followers push the rebbe around. Now, I am sure there are far more details and intricacies than what is reported in the article, but it still seems awfully disrespectful for a community that is normally so obedient and so subservient to suddenly be making such weighty decisions and take such strong action, without asking first. The Rebbe's son-in-law came to visit from the USA. When he got to the Rebbe's house, he found it empty and was told the Rebbe is in Tzfat for a short period of time. According to Rav Shpitz, the son-in-law, the family had been invited by the Rebbe for a visit, but some in the sect don't want him here. They had to pay their visit with security guards, because they were threatened (so they claim), and they say that the Rebbe was whisked away to Tzfat by the gabbai so that they would not be able to visit him. The hassidim claim that he always spends time during this period of the year in tzfat, and the Shpitz family has only come, uninvited, to create a provocation. What's the provocation? The kids are fighting over the inheritance. While inheritance fights usually happen after death, sometimes they happen while the parent is still alive as well. The Rebbe's son is fighting with the son-in-law. The son more or less controls the hassidus right now, while the son-in-law wants to open his own hassidic court. Right or wrong, I dont know and dont offer an opinion. Who deserves it, who is supported by the Rebbe, I have no idea, and I dont care. Whoever is right or wrong in this story, whichever side it might be, someone is acting on his own in a serious way and going against the Rebbe. This reminds me of the story with the Bostoner Rebbe in RBS not too long ago. There was also a fight there in the family as to who owns the property and who has a right to talk to the Rebbe. Police were called in, property was locked up, and people, who are normally so obedient to the Rebbe, were fighting and ignoring the Rebbe himself and even pushing him around. Do they only ask and listen when it is convenient? When nothing major is on the line? Is it a facade? Are these stories the anomalies? Highway 38 to Bet Shemesh To Be Upgraded! Good news about the upgrade of Highway 38, the highway to Bet Shemesh. The spokesperson for the Ministry of Transportation released a statement saying that the project for upgrading Highway 38, from Shaar Ha'Gay until Bet Shemesh, will go immediately to tender. the Ministry of Finance wanted to freeze all upcoming new tenders due to budget cuts, Highway 38 included, but Minister of Transportation Yisrael Katz demanded the continuation of a number of infrastructure projects, including the Highway 38 project. Katz circumvented the Finance Ministry, with PM Netanyahu's approval, and got the government's legal counsel to direct the Finance Ministry to approve the project. According to Minister Katz, the upgrade will shorten the travel time to Bet Shemesh and improve the security and safety of the road. The cost of the upgrade will be upwards of 800 million NIS, and should be completed within 3 years. The planning of the project and the actual work of the project will be done by the same contractor, which will ensure that the timeline for the project will be kept as short as possible. According to the information released, there will be 5 medians, or barriers, dividing the lanes - at Derech Burma, at Khan Shaar Ha'Gay (the khan is the ruin by Shaar Ha'Gay built in the 1860s to act as a hostel for travelers to Jerusalem to stay overnight), by Messilat Tzion, by Tzomet Shimshon and by Naham. In addition, by Messilat Tzion there will be a ecological crossing path for animals, and by the entrance to Bet Shemesh there will be a bridge so the road will avoid the train tracks. It will take a miracle for this to actually be completed within 3 years, but this is a land of miracles! And, the coming 3 years of roadworks are going to make an unbearable situation even worse, but the light at the end of the tunnel is not an oncoming train, but a better highway. Are Republican presidents Better For Israel Than Democrat Presidents? I have already voted, absentee, in the 2013 US elections. I celebrate the freedoms this world offers to me, and voting in the US elections is one of those freedoms. it is a responsibility, a freedom and an honor to be able to participate in the democratic process, to influence, even in just a small way, one of the greatest and most powerful countries in the world. No, I won't tell you which candidate I voted for. That being the case, I truly don't believe there is much of a difference between Republican and Democrat presidents in regards to Israel. They both try to make it appear as if they are great friends of Israel, but, I think and understand from many things I have read, that when the media is not present presidents from both parties put the screws to the Israelis in order to promote American interests. I really don't believe a Republican president is more friendly to Israel, despite the public image that this is the case, and more flexible for Israel's needs than a Democrat president. I really think it makes no difference, from Israel's perspective, which candidate will win. Support for this position can be found in Efraim Halevy's op-ed article today in the New York Times. Efraim Halevy is a former head of the Mossad. According to Efraim Halevy, the more serious and intense pressure on israel always came from the Republican presidents, and not from the Democrat presidents. And he notes that George W Bush was the most notable of presidents to pressure Israel to support policy that was counter to its own interests. Halevy says that despite statements indicating otherwise, Democrat presidents never strong-armed Israel. Indeed, whenever the United States has put serious, sustained pressure on Israel’s leaders — from the 1950s on — it has come from Republican presidents, not Democratic ones. This was particularly true under Mr. Obama’s predecessor, George W. Bush. Despite the Republican Party’s shrill campaign rhetoric on Israel, no Democratic president has ever strong-armed Israel on any key national security issue. In the 1956 Suez Crisis, it was a Republican, Dwight D. Eisenhower, who joined the Soviet Union in forcing Israel’s founding father, David Ben-Gurion, to withdraw from the Sinai Peninsula after a joint Israeli-British-French attack on Egypt. In all of these instances, a Republican White House acted in a cold and determined manner, with no regard for Israel’s national pride, strategic interests or sensitivities. That’s food for thought in October 2012. Perhaps Halevy has an agenda. Perhaps Halevy is working to counter the image of Netanyahu seemingly supportive of Mitt Romney so that Israel does not "lose" no matter who wins. Or maybe he is telling it like it is. The calendar of zmanim in Israel has a nice feature. It might be in others as well, I don't know, but I am referring specificially to the calendar called itim L'Binah which has become fairly standard in many places for people who want the halachic times relevant during the day (e.g. mid-day, midnight, sunrise, sunset, day break, etc...). The nice feature they have in this calendar is that on the side of the week, they have each day of the week with special notes of what happened historically on that day to make it special. often the day is tagged with the yahrtzeit of a famous Jewish rabbi, but sometimes there are historical events listed as well. [year 3340] The eyes of Tzidkiyahu were blinded and his children were slaughtered, the day is worthy of a fast. Today when looking at the calendar I noticed that Thursday, the 9th of Cheshvan, has a special event listed beside it. On the 9th of Cheshvan, in the year 4926, the Rambam went to Hebron and merited praying there. He declared the day to be a yomtov, one of celebration, prayer, praise and happiness. First of all, it makes one take stock for a moment - look how easily we are able to go to hebron to pray. Hop in the car and 45 minutes later, or so, and I am there and can pray. Any day of the week, any time of day. As often as I want, whenever I want. Yet then it was so rare that the Rambam felt so much joy at being able to successfully go and pray in Hebron that he turned it into a holiday. Some historical perspective of how blessed we are, without even noticing it necessarily. Second, and this was really my point, is that they missed a holiday. And I only noticed it because they wrote about the Rambam's visit to Hebron on the 9th. Had they not written that historical event on the 9th I would have thought nothing of what they left out on the 6th. Now, if the author had not said anything about the Rambam and Hebron on the 9th, I would not have noticed the omission on the 6th. The calendar obviously cannot, and does not, write every single historical event that happened on any given day. But having written about the Rambam and Hebron on the 9th, the omission of the Rambam's visit to Har HaBayit on the 6th was glaring. In the craziest, and perhaps the most interesting, announcement I have heard in a very long time, the NachNachim division of Breslav, the guys who dance through the streets and on the roofs of panel vans with music blasting, have announced that they will be forming a new political party and running for Knesset in the upcoming elections. They even think that, despite their relatively small numbers, they can achieve a whopping 10 seats. According to the article in Ladaat, the group has chosen the letter 'Nun' (נ) as their party letter for voting, after the name of Rebbe Nachman. I would have expected them to choose ננח or נחנח or maybe אומן, but נ works as well. They say their goal is to bring holiness to the Knesset, and to obtain funding for Breslav institutions. They too, along with various other sub-sectors of the Haredi community (such as the "new haredim", such as the Yerushalmim, Rav Amnon Yitzchak's people, and others), claim that the reps in UTJ and SHAS only work each for their own sector, while ignoring the needs of baal teshuva community. One law we can be pretty sure they will work for passing, if they do actually run a party and succeed in getting into the Knesset, is a law legalizing marijuana. You mentioned the Navy, for example, and that we have fewer ships than we did in 1916. Well, Governor, we also have fewer horses and bayonets because the nature of our military's changed. We had these things called aircraft carriers where planes land on them. We have these ships that go underwater, nuclear submarines. So the question is not a game of battleship where we're counting ships. It's 'What are our capabilities? 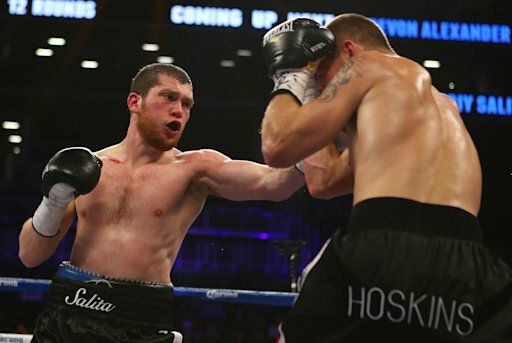 Dmitriy Salita, the Orthodox boxer, rabbinical student, from New York, continued his comeback with a fight this past Saturday night. Salita fought against Brandon Hoskins, and the bout was scheduled for only a short time after the conclusion of Shabbos. Salita stayed in a nearby hotel, and then walked to the arena, and quickly got his hands taped with no time for warming up. Salita says he had to use the first two rounds of the fight to warm up, because of it. Salita won his match unanimously, and said that if he had had two more rounds he would have knocked Hoskins out. Salita's record is now 35-1, and he is looking toward a possible title fight, for the welterweight title. The big news of the day is the NY Post article that discovered discrimination against Orthodox Jews in a cafe in Brooklyn. All the frum news sites have been posting about the article. According to the expose, this popular cafe, called The River Cafe, has discovered that it is a popular spot for shidduch dates. The only problem with this is that they also realized that the Orthodox Jews on these dates spend very little money - meaning they are taking up spots in the cafe but the cafe is making almost no money off them, and they can't get paying customers in their place. The solution they came up with, which they deny, is to charge a $25 minimum fee to anyone appearing to be Orthodox Jewish (e.g. if they came with a religious top hat and strings), and they devised an intricate set of codes for passing along the message when letting them in as to how much they should be charged. The Orthodox Jews who go there are obviously only going to be buying drinks, as the food is not kosher, but it seems they don't even really spend much on drinks. It seems, from the article, that these Jews pretty much only get water. So, they really are taking advantage of an expensive location and preventing the patrons from making money with other customers. Discrimination is always bad. The cafe should perhaps set a minimum that applies to everyone (they claim the minimum does, but the expose showed that it is only enforced for the religious Jews, along with when the Jews would be seated), even with the knowledge that most people won't have an issue with it knowing that if they are about to spend $70-$100 on dinner, they will definitely pass the minimum. As long as it applies equally to everyone it is legitimate - not everyone will be eating dinner or spending a lot of money. And people going on shidduch dates should be more careful about not taking advantage of others, whether it is the River Cafe or whether it is sitting in a hotel lobby nursing one Diet Sprite for 4 or 5 hours. The iconic River Café on the Brooklyn waterfront in DUMBO — famous for its floating-barge dining room that offers sweeping views of lower Manhattan — discriminates against Jews dressed in religious garb by requiring them to pay a minimum of $25 per person to sit at the bar, according to one current and one former employee. The reservationists — who stand at the entrance to the popular wedding venue and tourist destination — are instructed to use code words to alert the maitre d’ if anyone wearing a yarmulke, “religious hat” or “strings” asks to be seated at the scenic bar, the workers say. “There are several notes in a book that the reservationists use,” said a current employee at the restaurant, which opened in 1977. The book is kept at the greeting stand. New notes are added periodically by management, and employees are expected to read it before every shift, staffers said. Restaurant officials denied the claim. Images of the reservation book were provided to The Post to back up the employees’ claims. On Thursday evening, The Post sent a Jewish couple to the bar. The husband, wearing a yarmulke, and the wife, dressed in a simple long skirt, were told the bar was full. They were told they could sit on the empty terrace and pay a $25-per- person minimum. Five minutes later, two Post reporters, wearing no religious garb, were seated on the terrace and were not required to pay a minimum. The bill for a coffee and a gin-and-tonic totaled $18.51. The River Café — a non-kosher eatery famous for its $100 three-course prix-fixe menu featuring lobster, foie gras and rack of lamb — has become a popular date spot with Orthodox Jews, who are required by their religion to choose public places for dates. Current and former employees said these couples come for the view and non-alcoholic beverages, and are frowned upon because they take up seats and don’t spend enough money. Lastly, Shyne shared a little piece of advice for President Obama, or perhaps a threat? The young man who discovered the remains of the body of Majdi Halabi is suing the Ministry of Defense. For some strange reason, they don't want to give to him the prize money they had promised to anyone who would provide information leading to the discovery of the body. This fellow, Ibrahim Kuzali, discovered the actual remains and reported his find, yet they are refusing to pay out. Kuzali is suing for 40 million shekels. Their claim, Kuzali says, is that when he discovered the remians it was not known that they were of Majdi Halabi. That is the stupidest excuse I have ever heard. Who cares if he knew or not, and considering it was just remains how was he supposed to know anyway!? Either way, he discovered the remains, he enabled the recovery of the remains and the closing of the ordeal and he deserves the reward money.